Add this issue to your photographic library for information on the Canon EOS 1000D and Speedlite 430EX II. Plus techniques on Picture Styles, changing your viewpoint, expanded ISO, Canon's nifty fifty lens put through its paces, and EOS 450D and 1000D compared. New products EOS 1000D; Speedlite 430EX II. Professional showcase Christie Goodwin is breaking into the tough world of rock photography with nothing more advanced than an EOS 400D. She tells Angela August how her photography is more about art than hardware. Shutter button Pressing the shutter button fires the camera shutter, doesn’t it? Well, yes, says Robert Scott, but that’s just the start of it. There are several useful functions linked to this basic camera feature. 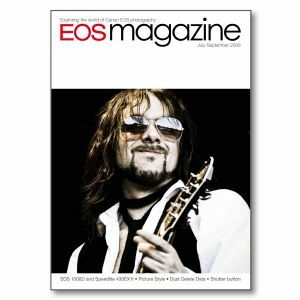 EOS exposed The new EOS 450D, introduced earlier this year, is notable for a number of innovations, improvements and upgrades. We compare these features with those on the new EOS 1000D. Prime time When Brett Harkness was planning his latest trip to India he made a decision to take just one lens. He tells us how his chosen piece of glass, Canon’s EF 50mm f/1.2L USM prime lens performed. Picture style Before the advent of digital photography, photographers would choose a film type to match a subject. Now, a photographer with an EOS digital camera can use Picture Style instead. Andrew Gibson explores the settings and their effects. The right angle A simple strategy to lift your images out of the ordinary is to shoot from a lower or higher viewpoint. EJ Baumeister Jr shows how a handy little accessory can make a big difference. Expanded ISO Some EOS digital cameras have ISO settings which fall outside the normal range. What is special about these values, and when should you think about using them? Dust buster There is a new feature in EOS cameras designed to help overcome the effects of dust on the digital sensor. Gary Friedman investigates how it works and finds out if it is effective.